An afternoon spent at a swimming pool is a great way to enjoy time with the family, especially for energetic kids who love the water. 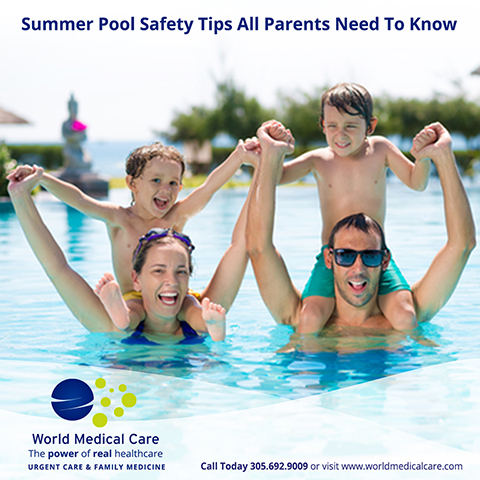 Yet it’s important for parents and children to always Pool Safely while they’re in the water. Pool Safely means adopting critical water safety steps to assure that a great afternoon at the pool doesn’t turn into a tragic one. Whether a family is at a residential or public pool or spa, parents and children can always take additional steps to be safe while having fun. Here are a few proactive tips to stay safe this summer. Walk, don’t run- Teach your kids the “No Running Rule” or roughhousing around the pool. As grownups know, wet feet can easily slip when running, and the tile or concrete surrounding a pool is less than forgiving. This one is a safety must do. If your child happens to slip, be sure to have an urgent care phone number handy. Surround Your Pool With a Fence- Install a fence that’s at least four feet high around the outside of your swimming pool and spa. This will help prevent your children from slipping in the pool or diving in without supervision. Take a swim class- The American Academy of Pediatrics recommends that children ages 4 and older learn to swim in order to help prevent drowning. It also encourages parents of children ages 1-3 to consider swim instruction for their child, as studies have shown it reduces drowning incidents. All parents and caregivers should learn to swim as well. Learn CPR- The moment a child stops breathing there is a small, precious window of time in which resuscitation may occur, but only if someone knows what to do. Even if you’re not a parent, it’s important to learn CPR. The techniques are easy to learn, it is critical to have a phone nearby and immediately call 911. Check your local community schools for CPR classes.